While plant and equipment spending for the entire economy was down in the fourth quarter, it only fell by 4.4 percent from its level in the fourth quarter of 2007. By contrast, venture capital investment was down by 31 percent. In the fourth quarter of 2007, $8.1 billion was invested in 850 venture deals. In the fourth quarter of 2008, $5.6 billion was invested in 790 deals. The number of deals is not abnormally small—over the last five years, the fourth quarter has seen 750 deals on average, but the total invested is down a lot from last year. This bodes ill for the 2000 vintage of venture capital. Compare and contrast two vintages of venture: 1992 and 2000. First note that we look at venture vintage years a bit differently from how other analysts look at them. Others look at the year a venture fund originated. Our vintages represent a set of companies that got their first round of venture funding in a given year. In our analysis, the 1992 vintage year is all companies who received a first round of venture funding in 1992. To produce this chart, we add up all the investments made in the 1992 vintage companies, both in 1992 and all subsequent years. We benchmark that total at 100 to make years easy to compare. The blue line shows the total capital to be invested in the companies, and it declines over time as investments are made. The red line shows the value of portfolio companies that are in venture portfolios, only from the 1995 vintage. 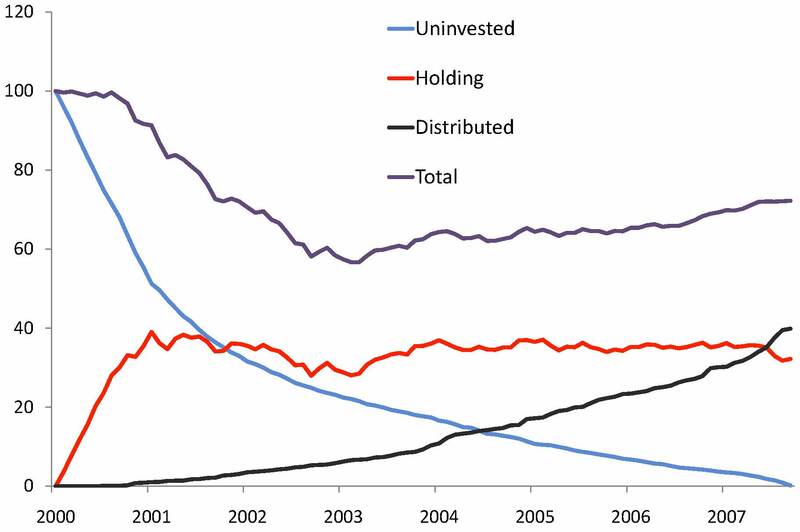 The black line shows cumulative distributions to investors from acquisitions and IPOs. (This chart does not follow companies after they go public. We figure there are already enough folks tracking public companies.) 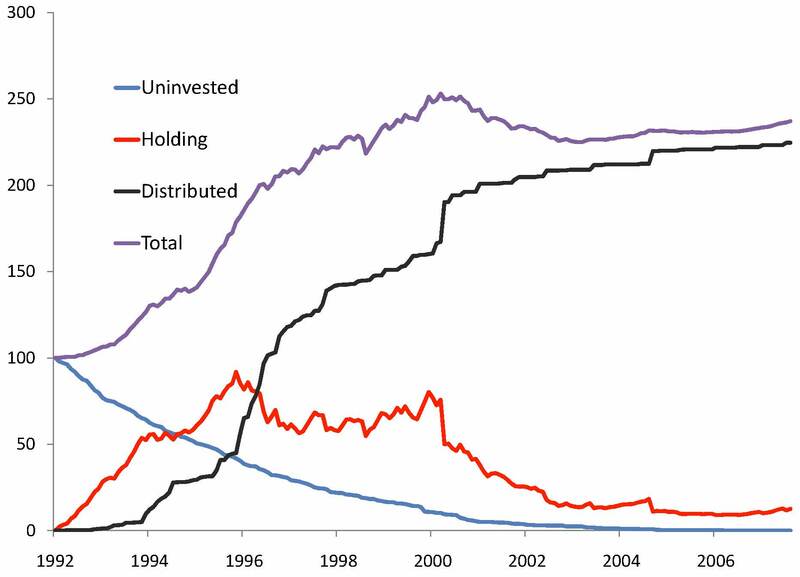 Then there is the purple “total” line, the sum of capital that will be invested, value carried in private companies, and distributions to investors. Notice how the total line slopes upward most steeply in the early years, typically years 3-6, as the best investments exit. The best exits are among the earliest, it seems for no more profound reason than the best ideas are evidently the best fairly early. As time passes, the additional exits are middling. Chances are, after 7 or 8 years, that if a company has not done something great for its investors as yet, it is not going to. This is a bit less true for the life science sector of venture than for information technology. But then, life science is the less risky sector of venture capital by every metric. For 2000, distributions (from IPOs and acquisitions) are still below the amount invested. The “total” value line (purple) is above 100 near its end only because of the value at which portfolio companies are being carried. With the recent blow to asset prices, these must fall. Thus, it looks like 2000 will be the first year that venture capital as a whole will fail to return capital to investors. Note that these figures are before the general partners’ take (a percent of invested funds and a fraction of capital gains), and are thus gross results, not net results to investors. They are compiled from the database at Sand Hill Econometrics,built from data from Thomson, DowJones VentureOne, and a lot of our own research to fill in holes for valuations, shutdowns, and acquisition values. We believe that this data comprise very close to the universe of venture-funded companies from 1989 to the present. Originally published at Woodward&Hall weblog and reproduced here with the author’s permission.